ASPEN – Aspen resort officials can only watch and wait for what comes next with Frontier Airlines, the Denver-based carrier that soon might be up for sale. In the meantime, Frontier is one of three carriers that will serve the Aspen market this winter – a ski season that will, for the first time, see American Eagle service and as many or more out-of-state connections on United Airlines as there are United flights to and from Denver. “We’ll see up to 30 flights a day when it’s all said and done,” said Bill Tomcich, president of reservations agency Stay Aspen Snowmass and the resort’s liaison to the airline industry. United will remain the dominant carrier in the local market. It currently operates five daily connections to Denver, bumping up to nine or so flights daily on Nov. 29 and then to 12 daily connections starting Dec. 15. It will operate between nine and 12 daily flights to and from Denver after the holidays, as well as four daily connections with both Chicago and Los Angeles, one or two daily connections with San Francisco, and two daily connections with Houston. On some days, there will be more out-of-state connections than there are Denver flights on United, Tomcich noted. That’s a first in the local airport’s history with United, he said, crediting the recently constructed extension of the runway for facilitating longer-distance, nonstop flights. 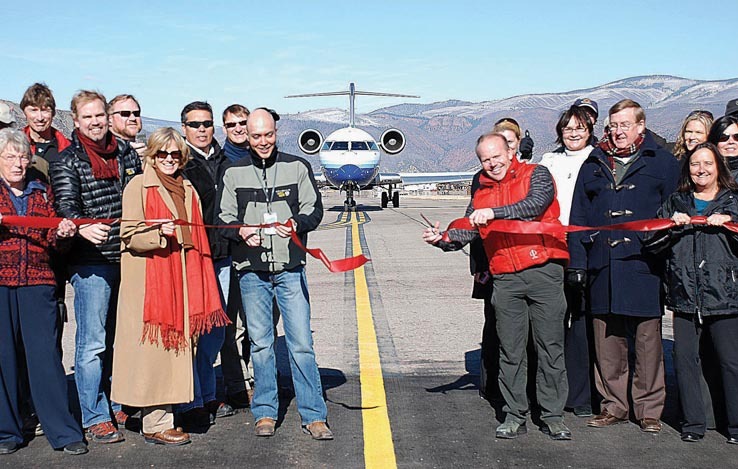 Local elected and government officials and other resort representatives gathered Wednesday morning on the taxiway at the Aspen-Pitkin County Airport for a ribbon-cutting ceremony to mark last week’s completion of the $15.4 million project to add 1,000 feet to the south end of the runway. The added length is expected to ease weight restrictions on takeoff, allowing commercial jets to carry sufficient fuel for longer-distance flights without leaving seats empty. It will mean the United Express jets serving Aspen can carry up to an additional 2,500 pounds, according to Brent Wilson, manager of aircraft operations for SkyWest Airlines, which operates the United Express flights. He participated in Wednesday’s festivities. The additional pavement adds to the potential profitability of United’s connections between Aspen and places like Chicago, according to Tomcich. “They can operate those flights with full payloads, which had not been possible before this ski season,” he said. American Eagle announced in July that it would begin winter and summer service to Aspen, starting Dec. 15 with a daily connection to both Dallas/Fort Worth and Los Angeles. AmericanAirlines representatives credited the longer runway with making the nonstop service possible. Frontier, currently serving Aspen with one daily connection to Denver, will add a second flight Nov. 17 and bump up to four daily flights for the winter, starting Dec. 15. The Q400 turboprop it uses doesn’t require the extended runway – now 8,000 feet long – but Frontier needs the aircraft to maintain its Aspen service. The fate of the handful of Q400s still in parent company Republic Airways’ possession has occasionally been in question. Republic bought Frontier out of bankruptcy protection in 2009 with a bid of $108.8 million, beating out Southwest Airlines. But Frontier has lost $102.4 million this year, according to an Associated Press report, and Republic intends to seek a buyer for the airline. Already, Republic has jettisoned Frontier’s smaller planes and cut its unprofitable flights in an attempt to turn Frontier’s finances around, the AP reported, but it has held onto the Q400s. “The good news from our perspective is, thank goodness they got rid of the 50-seaters instead of the 74-seaters coming into Aspen,” Tomcich said. While it’s no secret that Frontier has been a cash drain for Republic Airways, which acquired Milwaukee-based Midwest Express at the same time it bought Frontier in order to merge the two, Frontier’s regional service between Aspen and Denver has continued to prove profitable, according to Tomcich. “Based on the numbers I’ve seen from the Pitkin County landing reports, their flights from Denver into Aspen have been performing remarkably well for the past four months or so, even outperforming United Express in terms of overall load factor in most cases,” he said. Frontier is now selling seats in and out of Aspen not only for the coming winter, but through July 9, according to Tomcich.